Pompey fans have been out in force with their views after the Blues moved to the top of the League One table following today’s 2-1 win at Peterborough. Second-half goals from Oli Hawkins and Jamal Lowe earned Kenny Jackett’s side victory over the Posh, who now drop to second in the table. 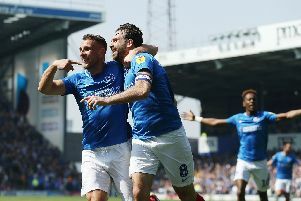 Here’s what fans have been saying with Pompey now the only remaining unbeaten side in the division. Well done Kenny & the team excellent result. Great result! Would have taken a draw if offered before the game but we got the job done. Curtis with another 2 assists, Lowe with another goal and Hawkins scoring one and playing a big part in the other. Those 3 are proving such a handful for any defence in this league. With Sunderland and Barnsley both losing we are starting to open a little gap to 3rd. Early days and it’s still only a good start at this stage but its looking good right now! If I am nitpicking, then we let what was looking like a comfortable result turn into a nail-biting finish again and we have to see out these games better but that doesn’t take away from a really good performance on the road against a team that had started even better than we had. Great result. And to boot, only really the first goal created and scored by the opposition in open play this season. All the rest are own goals/collisions or a gift by Burgess or penalties. Once the first half was played out they must have sussed the opposition. Well done, Ollie Hawkins: great contribution this season. Curtis now 5 goals and 5 assists. Lowe doing well, too. Looks like this team is well balanced and heading for success. PUP. Good result but the last few minutes were nailbiting, the game management still needs to be improved. What a brilliant result. If we had of lost it would not have meant we would not be promoted at the end of the season but, conversely, the fact we have won does not mean we will be promoted. What it does mean is that there is a 5-point lead on the 3rd placed team which means we have to lose two games for anyone to shift us out of the early promotion places. Well done to Hawkins too. He has had a lot of stick, which I am sure will carry on, but a couple more from him will help to dampen that out. I don't think he is the best striker we have, in fact I think he is behind both Pitman & Mason, but he is the best player playing in the way Mr Jackett wants to play. Great result. Well done to all but, particularly, Hawkins & Burgess who've both had vital parts to play in this important victory. Great result, so so pleased for Olli.